Keywords: irritable bowel syndrome, Alcat Test, elimination diet, food sensitivity. Patients with irritable bowel syndrome (IBS) have chronic symptoms and have usually been fully investigated with negative findings on endoscopy and barium studies. The patients may be variously described as neurotic or suffering from a functional disability [1, 2]. Consequently, an attempt is made to suppress their symptoms with a variety of anti-cholinergic and anti-inflammatory agents usually with partial success, but symptoms are often not eliminated completely. If one accepts an hypothesis that food might be implicated, and this is being more generally recognized [3, 4], then currently the only course of action to establish such a link is an exacting programme of dietary elimination followed by selective food challenges based on experience or more usually guesswork. In either event the process of identification is laborious and difficult for the patient and clinician, often with poor compliance by both! The advantages of a reliable in vitro test for adverse reactions to food would be to short-circuit this lengthy process. We describe the results of a cellular test which goes some way to fulfilling this objective. 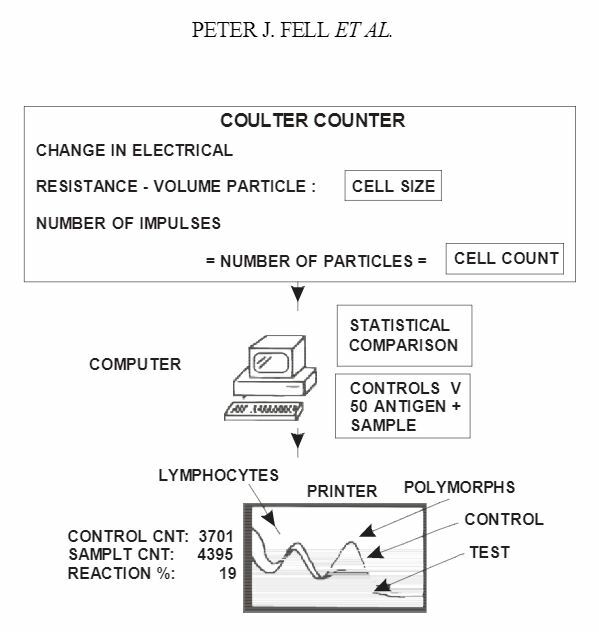 A diagrammatic representation of the computer-controlled Coulter counter method for counting and measuring white blood cell size utilized by the Alcat Test to determine sensitivity to foods. Twenty patients (16 female, four male, mean age 53 years, range 23-81), were selected who had a longer than three year history of IBS often associated with arthralgia, headaches and lethargy. They had all been fully investigated by endoscopy and barium enema and no major pathology demonstrated. Skin tests were performed on all patients and only one subject was positive (grass, peanut, potato, tomato, and cheese), the positives in this patient being confirmed by RAST. Citrated blood is diluted 1 in 5 with buffer and 500?l added to each freeze-dried food extract on nylon discs in Coulter-type cuvettes. The solution is buffered as a physiological fluid to pH 7.4 with sodium bicarbonate. The nylon discs contain dialyzed and freeze-dried skin test extracts of foods (Dohme Hollister Steer) taken from a solution of 50% glycerol and 50% water with a 1 in 10 dilution of the antigen. Following 45 min incubation at 37 degrees C with constant agitation, the cuvettes are incubated for a further 45 min at room temperature. Red cells are lysed by adding 16 ml Isoton II containing 0.5% Alcalyse to each cuvette. Each sample is then analyzed in sequence in a modified Coulter counter with one control for every 10 food tests. The 50 foods tested are shown in table 1. The basis of the Alcat Test is the accurate measurement of changes in cell size/volume following incubation with food extracts using the modified Coulter ZF linked to a computer. There are many publications indicating that contact between allergens and cells (lymphocytes and polymorphs) will cause autolysis, a phenomenon known as allergic autocytotoxicity (ACT). There are three mechanisms which cause this phenomenon, and one does not require the priming of cells in vitro by either antibody or antigen . It was on this basis that an automated method was sought which would not only be reproducible and objective but would directly correlate with in vivo food challenge. The computer is programmed to compare cultures incubated in the presence and absence of food extracts giving a percentage shift in cell volumes related to exposure to the extract; 13% and above being positive, 9% and below being negative with the intervening per cent equivocal. Previous studies [6,7] of healthy controls, as well as food sensitive patients, were used to determine the percentage levels. The University of Miami football team on a balanced nutritional plan, with no food sensitivity, aged 18-25 were compared with patients matched for age but suffering a variety of food sensitivity problems. The mechanics of the Alcat Test are shown in Figure 1. The study was double-blind with respect to food challenge in that those foods deemed by the tests to be negative and positive were randomly assigned to the challenge periods. The technician performing the test randomly selected three positive foods on Alcat Test and three negative foods. These were mixed and allocated to the patient’s number. The patients, physician and nurses monitoring the study were not involved in the randomization. A two week initial elimination diet based on Alcat Test results was followed by six single one week food challenges, (three positive and three negative) with randomly assigned foods. After this was a six week exclusion diet based on the original Alcat Test prediction with inclusion of any negative foods from the challenge period. It is accepted that the ideal method would be to blind each food in some carrier agent but the design of the study is such that it was thought necessary that the patients freely consumed the foods and were unaware as to whether there had been identified by the Alcat Test as positive or negative. They were not aware that the elimination diet contained only negative foods. It is accepted that a washout period would be ideal but this would have extended the study inordinately. Also, it was considered that by omitting the last three days of each week of consumption of a food, the carry-over effect was minimized. This meant that during the assessment period no new food had been consumed within 96 h. During a food challenge week the patient was asked to eat the particular food freely throughout the week. Throughout this period diary cards were kept and completed on a daily basis and if problems arose or inane food challenge caused a reaction the patient contacted the research nurse who instructed them to stop and return to the elimination diet until the next challenge was due. After the full 14 weeks of dietary manipulation, the patients were assessed by a clinician and a research nurse, the diary cards were examined and compliance discussed. The end of this period represented the end of the study and a global assessment was made as to whether these were associated with non-compliance. The global scores for all symptoms were analyzed using an analysis of variance with assessment of residuals in order to determine the validity of assumptions. To analyze the effect of individual food challenges, the symptom scores of the last three days of the initial two-week elimination period were summed to provide to provide a baseline for the subsequent challenges. A similar total was taken for each of the food challenge weeks (three positive, Three negatives foods). The scores for the last three days of each week were summed separately for each symptom and compared with the same three days in each elimination week. The individual symptom scores were analyzed using the Student t test. The clinical scores were analyzed for the initial two week period, the six individual food challenges and the final six week exclusion period. The clinical symptoms following food challenge were analyzed by dividing the data into two classes: ‘negative’ foods where the Alcat Test score was 1%-9% and ‘positive’ foods where the change was greater than 13%. As a result of analyzing symptom scores of 120 separate double-blind food challenges using an analysis of variance, 43 out of 60 positive foods on the Alcat Test produced symptoms whereas 11 out of 60 negative foods produced symptoms, which is statistically significant (p <=0.5). The symptom scores were significantly higher in the positive food group (p=0.02) and this group also needed more drugs than those weeks where they were eating foods which were negative on the Alcat Test (p=0.01). A wide range of drugs were used for these patients but it was not considered necessary to make a long list of the different of treatment that they received, but included were fibre products,- anticholinergic, anti-inflammatory and anti-spasmodic agents plus, in many instances, nystatin. It is also interesting to note that most patients were able to continue their challenge for a full week. In those patients (n=5 ) who stopped their challenges before the end of the full week ( nine food challenges ), the majority (eight out of nine ) were positive on the Alcat Test. Thus the Alcat Test classed as positive or negative and, omitting borderline values (9%-13%), was associated with an appropriate symptom score during blind challenge in 72% of positive foods and 81% of negative foods. The 9%-13% has been considered borderline based empirical on results from the Alcat Test accumulated so far. This again was a comparison between the healthy volunteers from the Miami football club and those attending Dr Sandberg’s clinic [6, 7]. Considering individual symptoms as shown in Table 2, there is a significant increase in symptom score following relevant challenges for all symptoms (p < 0.05). There was one exception-Backache, which was not improved but also confined to three patients so it was considered insufficient to record. All these sums were aggregated from the last three days of challenge versus the last three days of elimination. Means are not recorded because like most diary card keeping, the results skewed. At the end of the further six week elimination period, ten out of the 20 (50%) patients had maintained improvement and were still symptom free. Though we have no statistical evidence of this we consider the most likely cause of failure in 50% of the patients was due to lack of compliance. The diary cards in several indicated this. We have been able to show specific food sensitivities in a group of patients with IBS using an objective in vitro cellular technique. Eliminating the positive foods from the diet as defined by changes measured by the Alcat Test, two-thirds of the patients improved within two weeks. However, at 18 months follow up, the success rate had fallen to 50% of the patients being symptom free. On the basis of 120 separate double blind food challenges 72% accurately correlated with a positive and 81% with a negative test. This tailor-made diet has the advantage over the ‘best guess’ elimination regime in that it can pick out less-common foods that may cause reactions such as spinach, broccoli, apple, and rice which are not normally taken into account in devising such an elimination regime. The important factor in a syndrome with such a varied presentation and variability with time, is that it requires a direct effect to be demonstrated ‘within patient’, i.e. food challenge studies which are statistically controlled. A recent review of treatment for IBS Klein  concluded that “not a single study offers convincing evidence that any therapy is effective in treating the IBS symptom complex”. Yet, in none of the 43 trials reviewed was diet considered an important factor. There is now increasing evidence that diet should be considered to be important in this syndrome. The work of Hunter’s group  shows a definite link and a recent report by Nanda has also described good responses to food elimination diet in IBS with a 48% overall success rate during the 14 month follow-up period . If this period could be cut short, compliance would improve and the overall success rate might increase. The problem of unusual foods causing reactions still remains, perhaps accounting for some of the failures in the Oxford series. The underlying mechanism of the Alcat Test is not understood. Lymphocyte activation to food proteins has been shown with beta-lactoglobulin [9, 10] and rice protein , although others have not been able to confirm the clinical relevance of these results [12, 13]. Lymphokine production, especially leukocyte migration inhibition factor (LIF) has also been investigated for the diagnosis of food intolerance and good clinical correlations with positive tests have been shown . However, the cell culture time has been considerably longer than the 90 min used in are experiments. The mechanism of change in cell size in the Alcat Test awaits elucidation. Certainly damage to cells when in contact with foreign protein has been demonstrated by other workers [13-15]. Autocytotoxic phenomenon (ACT) is seen in bronchial asthma and is not always IgE mediated or the consequence of a priming action by antigens and antibody. The direct toxic effect of food antigens on specific cells may be a reassuring action to protect the immune system from infancy. However, some food lectins contribute to cell damage at the level of the gastro-intestinal tract  and may even cause cell death indirectly by the mechanisms that are unclear [5, 16]. Furthermore, many foods contain known pharmacologically active or toxic chemicals which may directly act on cells [16, 19]. Whichever mechanism pertains, whether of actively toxic agents, immunologically driven or not, and identified by the final common pathway of cellular change, swelling, vacuolation, degranulation or destruction, the Alcat Test provides useful results as the consequence of this final common pathway. The data from are trial and others [3, 4] clearly show that a proportion of IBS patients have a food sensitivity and an exaggerated colonic motility response to a stimulus that has no psychological significance . It is therefore unreasonable to consider that psychopathology is the main cause of the disorder . If our results are confirmed in a larger series of patients, then clearly this test would be useful adjunct in a busy gastro-enterology clinic where a considerable proportion of patients will be suffering from IBS. The development of ‘tailor-made diets’ designed for each patient must be better than the hit or miss methods currently available. 1. Waxman D. The Irritable bowel: a pathological or psychological syndrome. J Royal Society of Medicine 1988; 81:718. 2. Drossman DA. Psychological factors in irritable bowel syndrome. Gastroenterology 1988; 95:701. 3. Alun-Jones V, Shorthouse M, McLaughlan P, Hunter JO. Food intolerance: a major factor in the pathogenesis of irritable bowel syndrome. Lancet 1982; ii: 1115. 4. Nanda R, James R, Smith H, Dudley CRK, Jewell DP. Food intolerance and the irritable bowel syndrome. Gut 1989; 30: 1099. 5. Podleski WK. Autocytotoxic phenomenon in bronchial asthma. In: Intrinsic Asthma. Basel: Birkhouser-Verlag, 1989. 6. Sandberg DH, Pasula MJ. A comparison of the Alcat Test for food reactions amongst two population sub groups. Paper presented at the American College of Allergy and Immunology 45th Annual Congress. Los Angeles, CA, November 13 1988. 7. Fell PJ, Brostoff J, Pasula M. High correlation of the ALCAT test results with double blind challenge in food sensitivity. Paper presented at the American College of Allergy and Immunology 1988; 95: 232, 41. 8. Klein KB. Controlled treatment trials in the irritable bowel syndrome: A critique. Gastroenterology 1988; 95: 232, 41. 9. Baudon JJ, Fontaine J-I, Mougenot JF. L’intolerance digestive aux proteins du lait de vache le nourisson et l’enfant. Arch Francais Pediatrique 1975; 32: 787. 10. Endre L, Osvath P. Antigen induced lymphoblast transformations in the diagnosis of cow’s milk allergic diseases in infancy and early childhood. Acta Allergologica 1975; 30: 34. 11. Shibasaki M, Suski S, Nemoto H, Kuroume T. Allergenicity and lympho-stimulating property of rice protein. J Allergy & Clinical Immunology 1979; 64: 259. 12. May CD, Alberto R. In vitro responses of leukocytes to food proteins in allergic and normal children: lymphocyte stimulation and histamine release. Clinical Allergy 1972; 2: 335. 13. Scheinmann P, Gendrel D, Charles L, Paupe J. Value of lymphoblast transformation test on cow’s milk protein intestinal intolerance. Clinical Allergy 1976; 6: 515. 14. Ashkenazi A, Levin S, Idar D. In vitro cell-mediated immunologic assay for cow’s milk allergy. Pediatrics 1980; 66: 399. 18. Podleski WK. Elimination diet therapy in allergic children a word of caution (Letter to the Editor) Am J Dis Child 1985; 139: 330. 19. Finn R. Pharmacological action of foods. In: Brostoff J, Challacombe SJ, eds. Food Allergy and Intolerance. London: Balliere Tindall, 1987: 425-50.